Crepes for breakfast? What would your mom do? Besides, I told him, the batter has to rest for an hour before I can make them. “I’ll be out the door in a half hour. Do the math!” Indeed, the crepe recipe I’ve been using for the past 25 years insists you must rest the batter. Which I did on Thursday morning while he lay sleeping and I was enjoying a moment’s peace and a day off from work. In case you were wondering: I got those Nutella to-go packets at DeLaurenti. Turns out that rest (the crepe’s, not the kid’s) isn’t necessary according to “Cook’s Illustrated” whose recipe-tester acknowledged the controversy, noting that the practice of resting the batter is reported to make a more tender — and thinner — crepe. You can find their classic crepes with sugar and lemon recipe, complete with a lot of terrific tips for success, right here (trial membership necessary if you don’t already have a subscription — which you should). Or you can check out this recipe for crepes with dulce de leche and toasted pecans for free. And, hey! They’ve even got a great video on the subject, free for the viewing for the next four months. Me? I’ll stick to my old recipe, which makes about eight crepes. 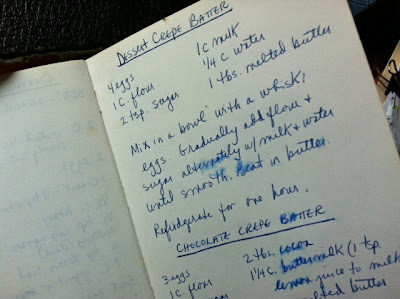 That one’s been in my handwritten recipe book for at least 25 years. And no, you don’t need a fancy crepe pan. My small, well-seasoned cast-iron griddle works perfectly. As did the non-stick pan I used to use before I had that one. Lodge cast iron. Works like a charm. 25 seconds on one side, 20 seconds on the other, says “Cook’s.” I’m not quite that precise. The pros say to pour a quarter cup of batter into the far side of the pan then tilt and shake it gently to fill the pan. I made this one the way I always do: by ladling the batter into the middle and tilting the pan every which way. Next time I’ll do it their way. If you have “extra” batter, cook off the crepes. When each is cool, slip it between a sheet of wax paper and refrigerate in a plastic freezer bag. Then, when your kid wakes up on Monday morning with only a half-hour left before it’s time to get to the bus stop, and you’ve got a crazy-busy day of work ahead of you, you can nuke the crepes, fill them with fruit and treat him to a quick breakfast. He begged for the canned whipped cream last night when we were at QFC. As you can see, I caved. But not without a fight. Hey, Nate! You’re welcome.